McCarran International reportedly has three pet relief areas, two outside Terminal 1 and a third outside Terminal 2 (charter and international flights). I found the one on the north end of Terminal 1, and it wasn’t easy. We came in on a Southwest flight that landed at a C gate, and although there must be a chance for C passengers to reach the ticketing area the main stream of traffic from C concourse goes to baggage claim. That’s bad news for pet owners, because the pet relief areas for Terminal 1 are located at the north and south ends of the Ticketing building, not the Baggage Claim building. Here’s what you do (it may help to follow along on this map of McCarran). No matter what concourse you’re arriving on, look for signs leading to the Ticketing area. If you’re lucky enough to find one, descend to the ground level, exit the building and turn either right or left. The pet relief areas are at each end (past either the Southwest counter, on the north end, or the Spirit counter, on the south end). If, however, you find yourself in the Baggage Claim building, exit by either Door 7 or Door 13. If you exit by Door 7, cross the street to the Ticketing building and turn left (north) to find the pet relief area. If you exit by Door 13, cross the street and turn right (south) to find the pet relief area. After all that walking, what you’ll find is disappointing. Here’s a picture, and the reality is just as grim. The pet relief area is about the size of a large bathroom. It’s fenced and lined in pea gravel. It includes a large support column, which presumably gives male dogs something to pee on, but also cuts down the usable space to the size of a large bathroom stall. (The roadway supported by the column does cast welcome shade on the area, however.) 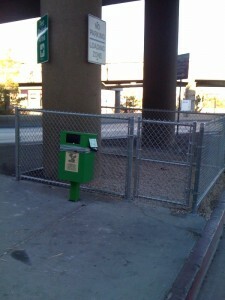 There is a poop bag dispenser and waste basket, but the north pet relief area was very dirty when we visited it. Unfortunately, I don’t have an alternative to offer you. There’s just no grass to be found at McCarran. There is an area just north of the northern pet relief area that features several palm trees and a pebbled, red rock ground cover, but the pebbles would be blazingly hot at any other time of year. Hi! I just wanted to let you know that there is grass to be found at McCarran Airport! If you go out the east doors from the ticketing area, go across the street (there are crosswalks) and turn left (north) there is a grassy hill just past the tiny pet relief area. Thanks so much for your message, Cheryl! I’ll look for it next time!